This hugging business can be quite annoying at times | Life, oh life! 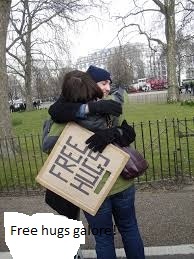 Hugging is the newest greeting in town. It has become so normal that people end up hugging even strangers. Well, i dont have a problem with those people who hug strangers, it is quite recommended at times. The rate at which bad stuff is befalling humanity, we all need a hug at one time or the other. My problem is with those people who ask to be hugged, you know, like you owe them one. There are these two men who work in the same building as I and they can be really annoying. Sometimes they block your way as you pass just so that you can hug them. Whatever time of the day you meet them they are soliciting for one and it makes me wonder whether they did not get enough hugs from their mums when they were young. My other beef is with those people who insist on hugging you even when you have displayed all the signs that you dont want to be hugged. Is it that some people are slow to understand sign language or they are just out there to annoy others? You have already stretched out your hand to greet them but they insist on pulling you towards them so that they can hug you. Some shake your hand but they still go ahead and hug you, quite forcefully! For the sake of humanity, please dont hug anyone and I mean forcefully hug someone if you smell like a garbage truck. If your mouth stinks enough to make a fly faint, keep away from hugs unless of course you are the one being hugged. And even when you are being hugged, try to keep your mouth shut, that way, you will save the ‘huggee’ from fainting. Hugging with your mouth open and talking loudly while splashing saliva open is an offence! I had taken a shower in the morning, I dont need to take another and more so not with your saliva. So try to hug me with some decorum, I dont want to be left wiping my face and ruin my make-up. If you didnt learn your Biology well, some airbone diseases can be spread through particles like your saliva. I still need my health you know, medical bills have become so high and I might not keep up. 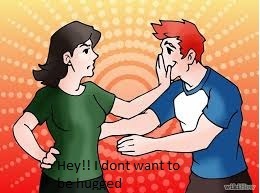 If you are a man and you are not my friend, boyfriend or relative, please dont insist on hugging me. If you insist on hugging me, dont make it look like you are hugging your girlfriend, you know with squeezing et.all. I dont want you getting comfortable while still holding on to me. Just hug me lightly and move on. As for mothers and fathers, hug your babies more often, it might help them in future. It helps in boosting their self esteem and teaches them to love when they are all grown-ups. Hug appropriately and with some decorum, it will go a long way. We dont want to hear people recounting of their bad hugs experiences, it is not funny at all. Did you know that you need 10 hugs a day? Hugging instantly boosts the production of oxytocin which helps in healing feelings of isolation, loneliness and anger. Try hugging your partner when he or she is feeling all down and depressed and see the reaction. It works like a charm. Holding a hug for an extended time will help in lifting serotin levels thus elevating one’s mood and creating happiness. Hugging is a self esteem booster. Our family’s touch is the most important thing especially when we are all young and vulnerable. It shows us that we are special and loved. Hugs and cuddles at a young age remains imprinted in our nervous system even into our adulthood. Therefore, hug your children as many times as possible because it has a lot to do with their self esteem. I make a point of hugging my son at least 5 times a day…Hugging connects us to our ability to love others. Hugging helps in relaxing muscles thus releasing tension from our bodies. Hugs take away pain; they soothe aches by increasing circulation of blood in the soft tissues. Hugging helps in building trust and a sense of safety. It helps in creating open and honest communication. 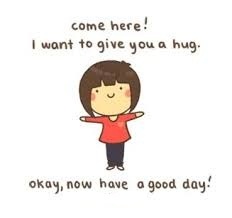 Virginia Satir a family therapist sass,” We need four hugs a day for survival.” “We need eight hugs a day for maintenance.” “We need twelve hugs a day for growth.” SO, HOW MANY HUGS DID YOU GET OR GIVE TODAY? GIVE AS MANY AS YOU CAN, IT IS A MIRACLE DRUG. FORGET THAT I RANTED ABOUT BAD HUGS, WE ALL NEED A HUG ONE TIME OR THE OTHER.